Ben Hutton’s fellow players sing his praises for having a strong work ethic and a team-first attitude. But that doesn’t mean the rookie shies away from taking centre stage once in a while. On the ice, the 22-year-old defenceman is in-sync with his fellow blueliners. Off the ice, No. 27 is equally in-tune with his teammates, so to speak. A commanding stage presence, coupled with wicked lip-syncing skills and an unbuttoned shirt, added up to an unforgettable crowd-pleasing moment and top marks from a panel of judges comprised of his Canucks teammates. If he had to do it all again – which he definitely would – what Hollywood celebrity would he choose as his on-stage music partner? “If I got a chance to do a lip sync with any celebrity, it would be Will Ferrell because he's my favorite actor and I also think he’s hilarious,” Hutton told NHLPA.com. When he’s not busy earning a standing ovation for his music act, the first-year NHLer is busy at work honing his craft as part of Vancouver’s defensive corps. Hutton, who scored his first big-league goal on January 17 against the New York Islanders, has felt right at home playing for the Western Conference club. 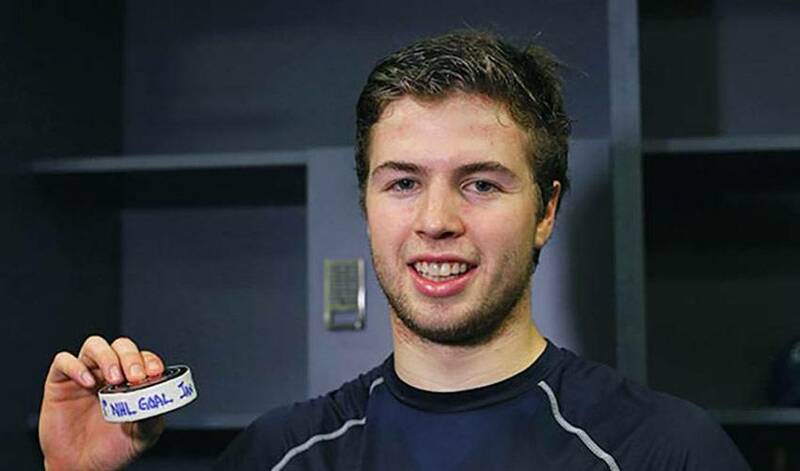 Hutton, who recorded his first NHL point on October 7, 2015 against Calgary, also points to his time in the collegiate ranks as a major contributor to his NHL success. He didn’t mention if he developed his penchant for people-pleasing entertainment during his days with the Black Bears. Hutton, did however, divulge which song he’d love to belt out with Ferrell given the opportunity. “I would probably let him pick the song, but if he gave me the choice to pick, I’d choose, "I Like Big Butts."